Essential when using with the high quality Acoustic Magic Voice Tracker I with a Mac, and a simple solution for computers without a sound card. Get full functionality out of your headset with this adapter, available from Pacific Transcription today. 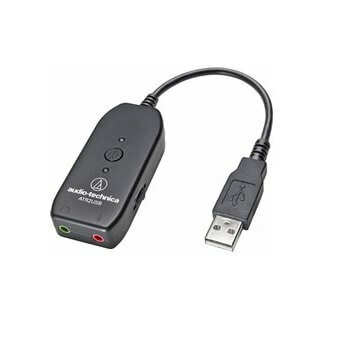 Audio Technica ATR2USB 3.5mm to USB Audio Adapter, essential when using the Acoustic Magic Voice Tracker I with a Mac, as Mac expects line level audio whereas the Voice Tracker has mic level analogue audio. This adapter is also ideal for using the Voice Tracker with Dragon NaturallySpeaking voice recognition software on computers with average quality soundcards. This audio adapter can be used with computers that have no soundcard.